1. Russell Wilson is the NFL’s most fascinating case study entering this season, his fifth as a pro. For his first three and a half seasons, Wilson was a sandlot style player who would abandon clean pockets in hopes of making a magical play out of structure. The results were good and bad. Wilson worked receivers open late in the down, but he also left a lot of open receivers on the field in the first place. Then, in late 2015, Wilson suddenly matured. Between Weeks 11 and 15, he threw 21 touchdowns versus just one interception while completing 69 percent of his passes to post a rating of 131.2. Operating primarily as a timing-based pocket passer. The Seahawks supported this by calling more spread formations and quicker timing dropbacks. In the playoffs, Wilson reverted back to his old ways at times, though not quite often enough to quash all hope. The Seahawks had been built around Marshawn Lynch and their running game. That’s changing. If Wilson is indeed a QB to build around, he’ll have to maintain his newfound pocket aptitude. And the beauty is that it won’t come at the expense of his sandlot playmaking powers. Those will always be there when needed. • QUARTERBACK FANTASY RANKINGS: The new and improved Russell Wilson checks in at No. 3. 2. The Seahawks are at their best when aligned in a 3x1 formation with the “3” side being a trio of wide receivers and the “1” side being a lone tight end. This was their key formation during the late-season stretch when Wilson got hot. This unbalanced set does several things: (1) It forces the defenses to reveal if it is man or zone coverage; (2) It sets up unique angles and spacing for Seattle’s zone running game, including the read-option; (3) It creates two different inside receiver spots on the trips side, which provides flexibility for deploying Doug Baldwin, who is a tenfold better receiver when he’s inside; and (4) It creates defined coverage looks against that lone tight end—an extra potent benefit if Jimmy Graham comes back healthy and is more comfortable in his second year with the club. 3. Thomas Rawls can be a poor man’s Adrian Peterson (in a good way). He is a violent lateral mover and finisher. The concern is how much his style jeopardizes his durability. The Seahawks share these concerns. That’s why they drafted three backs this year (C.J. Prosise, third round; Alex Collins, fifth round; and Zac Brooks, seventh round) and retained born again backup Christine Michael. 4. The Seahawks gambled heavily by not retaining fullbacks Derrick Coleman and Will Tukuafu. Those two combined to play 28 percent of the snaps last year. Their lead blocking provided the only source of dimension in Seattle’s base ground game aside from the read-option. 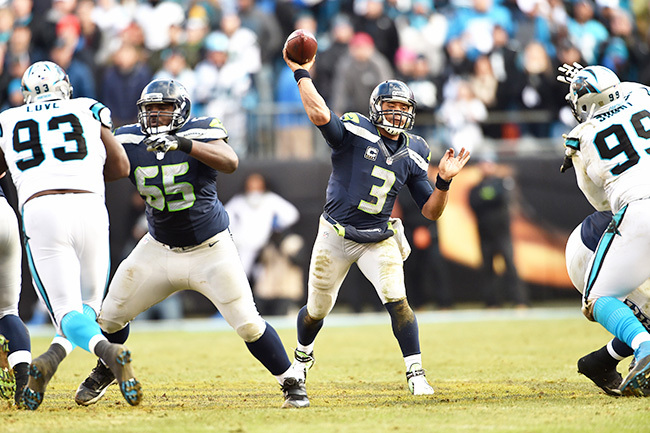 Wilson’s improvement as a pocket passer gives the Seahawks’ offense hope post-Marshawn Lynch. 5. Concerns about Seattle’s youthful, retooled offensive line are justified. Because of Wilson’s legs and the quick-strike spread passing game, a weakness in pass protection is not as damaging to this offense as it might be to others. That said, Seahawks coaches feel another reason Wilson got so much better in the last third of 2015 is his O-line finally congealed. Center Patrick Lewis stabilized the middle; Garry Gilliam, who played tight end at Penn State, improved at right tackle. Now Lewis is back on the second string, with the wildly up-and-down Justin Britt moving from left guard to center (this coming one year after Britt struggled moving from right tackle to left guard). And Gilliam is playing on the left side in place of the departed Russell Okung. Flipping sides is very challenging for any raw player; Gilliam now has to now learn the inverse of all the mechanics he finally honed a year ago. Frighteningly, Britt and Gilliam are the two surest things along Seattle’s front. The other positions will mostly be filled by first-time starters. • GARRY GILLIAM HAS BIG SHOES TO FILL: And 11 other trouble spots across the NFL created by offseason movement. 6. If the Seahawks are uncomfortable with their No. 2 corner situation (like they were for much of last year), they’ll have Richard Sherman travel with opposing No. 1 wide receivers again. And in that case, offenses need to align those receivers on the left side in order to make Sherman play right cornerback, where he’s less experienced. The Niners did this with Torrey Smith against Sherman in Week 11 and the Steelers did it the following week with Antonio Brown. To his credit, Sherman thoroughly won both matchups. Still, forcing the elite left side boundary corner to play elsewhere would be smart. 7. Cliff Avril is the most underrated pass rusher in the NFL. When it’s an obvious dropback situation, Avril’s get-off is as good as almost anyone’s. And his transition from speed to power is class-setting. 8. Earl Thomas and Kam Chancellor are extra valuable in Seattle’s Cover 3 scheme. Against three receiver sets (the new base package in today’s NFL), Seattle’s scheme has Thomas cheat over a few yards from centerfield so that he aligns closer to the strong receiver side. That means Thomas needs all of his speed, range and awareness in reacting if the ball goes to the weak side. On that weak side, Chancellor plays in what they call the “high hole”—an inside void a few yards deeper than the underneath linebackers. From here he can read routes clearer. The tricky part is Chancellor still has the same run-fit responsibilities as the linebackers, even though he’s deeper. Combined, the two safety positions are more important in Seattle’s scheme than in any other. 9. Weak side linebacker K.J. Wright is the seventh best player on this defense—but he’d be the first or second best player on several other NFL defenses. The long-armed sixth-year pro is physical and alert in run D, smart in zone coverage and capable of handling quality tight ends in man coverage. • CARDINALS 10 THINGS SCOUTING REPORT: A look at Seattle’s NFC West rival, including why Carson Palmer should bounce back from a late-season meltdown, David Johnson’s rising star, and why Chandler Jones might not fix their pass-rush problems. 10. It will be very interesting to see how Kris Richard calls this defense in his second year as coordinator. For much of last season, Richard expanded from the basic Cover 3 foundation of predecessors Gus Bradley and Dan Quinn, incorporating more man-to-man, blitz packages and two-high safety looks. The results were fluctuant. Will Richard view this as growing pains for his defense and continue to call a broader game? Or, will he view it as growing pains for himself and just go with what has always worked for this defense?